WASHINGTON (CNS) — President Barack Obama’s package of actions affecting millions of people without legal immigration status received support from Catholic organizations, labor unions and immigration advocates even as critics contended that the steps he announced violated the Constitution. Advocates for the immigrant community, including national and international church agencies, continued their call for Congress to enact comprehensive immigration reform that would include much of Obama’s executive action announced Nov. 20. Among the supporters of Obama’s action was Archbishop Thomas G. Wenski of Miami, chairman of the U.S. bishops’ Committee on Domestic Justice and Human Development. He was joined by more than 200 people attending the archdiocese’s annual Catholic Legal Services banquet celebrating the accomplishments of immigrant Americans in greater Miami in watching the president’s televised speech. The response of the immigration lawyers in attendance was generally positive, he said. Elsewhere, some of the most vocal reactions came from members of Congress. Predictably, the comments broke along party lines, and the debate among legislators on exactly what shape immigration reform will take will likely continue into the future. “We will listen to them, work with our members, and protect the Constitution,” he added. As soon as the president finished speaking, several Republican leaders called his planned immigration reform an abuse of power because Obama had not worked with Congress on it. Some threatened to file lawsuits in an attempt to block the president’s actions. Sen. Marco Rubio, R-Florida, said immigration reform was needed but he disagreed with the president’s plan, saying the borders must first be secured and immigration laws enforced. Even before the president publicly announced his immigration plan, congressional Democrats promised to stand behind his efforts. “Immigrant communities have waited too long for House Republicans to catch up with the American public’s support for comprehensive immigration reform,” said a Nov. 17 letter to the president signed by leading top Democratic senators. After the president’s announcement, Senate Majority Leader Harry Reid of Nevada called the plan “great news” to keep families together. Among agencies working with immigrant communities in the delivery of services, the plan was welcomed. 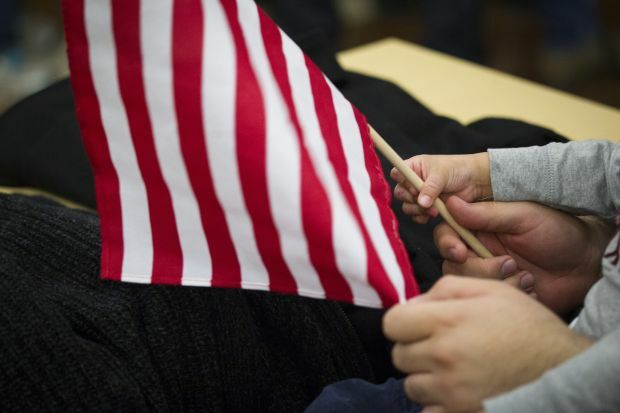 At Catholic Charities USA, Father Larry Snyder, president, said the organization was hopeful Obama’s plan will lead to much-needed legislation to provide workers with a path to permanent citizenship. He welcomed aspects of the president’s plan that would prevent families from being split up and protect children fleeing violence in their homeland. O’Keefe said in a statement that the conditions that push migrants to leave their homelands in the first place must be addressed alongside any legal reform effort. The agency called for deeper investments in job creation, education and the revitalization of rural economies in Honduras, El Salvador and Guatemala so that children and families in those countries can overcome poverty and insecurity that leads to migration. Sister Simone Campbell, a Sister of Social Service, who is executive director of the Catholic social justice lobbying group Network, supported the plan, saying she was rejoicing in knowing that immigrant parents living in the shadows are more assured that they will not be apprehended with little warning and separated from their children. She said in a press release that the organization’s nationwide network of grass-roots activists began calling legislators Nov. 21 to urge them to support the Obama plan and to quickly enact comprehensive immigration reform legislation. The humanitarian agency Church World Service said the president’s action upholds the dignity of the immigrants struggling to survive. The Rev. John L. McCullough, president and CEO, said in a statement that the organization’s supporters and participants had prayed, fasted and organized on behalf of immigrants for years in an effort to change immigration laws. “Our immigration system has been broken for far too long. The president has the full constitutional authority, and a moral obligation, to keep families together and stop needless deportations. We applaud this historic action,” he said. “As people of faith, we believe in the dignity of all people, in the unity of all families and in the power of redemption, and that the implementation of this executive action should reflect those values,” he added. “Giving some 5 million immigrants a chance to work legally and live in dignity, combined with the end of the misnamed Secure Communities program, is a significant step towards bringing our dysfunctional immigration system into balance after years of ramped up deportations, out-of-control enforcement and millions of families being ripped apart,” Sharry said in a statement. Other supporters of the plan included the National Employment Law Project, American Immigration Council, Alliance for Citizenship and Jim Wallis, president of Sojourners, and the AFL-CIO. Contributing to this story were Dennis Sadowski and Carol Zimmermann in Washington. Church leaders will speak out especially when they do not have to pay for their actions. What this dictator-president did was break the law. Two illegal positions do not make it right but that is okay with church leaders as the country sinks into a communistic way of life by this flawed philosophy of making all people the same. The end does not justify illegal means. Our Church leaders need to remember this. They are treading on dangerous waters here.